Alarm clock screaming bare feet hit the floor. It’s off to the races everybody out the door. I’m feeling like I’m falling behind, it’s a crazy life. Ninety miles an hour going fast as I can. Trying to push a little harder trying to get the upper hand. So much to do in so little time, it’s a crazy life. What wonderful words from the song, Just Breathe by Jonny Diaz. This is just the first part of the song where the pace of the song is ramping up, music getting louder and pounding of piano getting harder. As you listen to the song you feel that all-too familiar heart-racing feeling of going ninety miles an hour exactly as he describes. And then he gets to the chorus and there is no fast or hard pounding and no hurried feeling. But rather just a soft piano with a whisper of a voice and you can almost physically feel your body melt into the “Calgon take me away” mode of peace. That’s Jesus. That’s Peace. Our days are chaotic. Our feet hit the floor running. We go ninety miles an hour. But if we can just breathe. Deeply. And rest at His feet for 10 minutes before we get the call from Mr. Chaos, I promise the day will feel much smoother. Try it today. When chaos calls, politely hang up and just breathe! 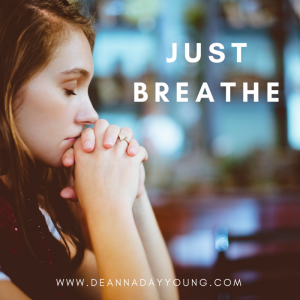 This entry was posted on October 13, 2017 with tags: #dailydevotions, #jonnydiaz, #makeadifferenceeveryday, peace, prayer by Deanna Young.